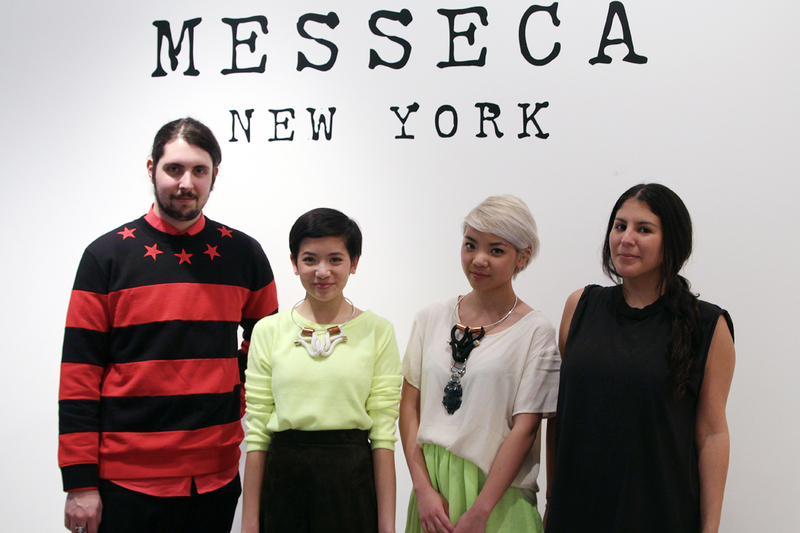 Our second last day in New York for Fashion Week completely revolved around a visit to the Messeca showroom. If you don’t know or if you did know and wished to forget, I’m here to tell/remind you about that one time (read: eight times) we guest blogged for the brand’s website. We informed (although I’m not sure informed would be the right word considering how utterly silly and nonsensical the information actually was) readers much like yourselves how to adequately cross-coordinate with a friend in a series of preposterous situations. Anyway, it seems as though head honchos Conor and Nicole don’t think we’re too bonkers for real-life interaction, because they welcomed us with open arms and no trace what-so-ever of fear and/or uneasiness. Upon arrival, we – of course – fell into a daze over just how many shoes were in that room. We learned that many of them won’t even go into production because a general consensus proved that they were just too impractical for the everyday consumer. Lucky for us, we’re not the everyday consumer. In fact, the level of impracticalness is a major factor in our decision-making process of buying shoes. With that being said, you can imagine our delight when finding out that a) we’re the sample size and b) they have nothing better to do with this cornucopia of unusable footwear than hand `em over to lil ol` us. We both ended up walking away with this particular pair of icy-toned sneaker wedges that feel exactly like pillows for your feet, amongst a few other pairs (including an 8-inch-heeled Lady Gaga boot that we plan to use as a flower pot). A big fat thank you goes out to the designer behind the brand, for being a wonderfully creative individual. We wish we could have you produce all your footwear, impractical or not, just so we can have them in our closets. And of course, we don’t want to leave out Conor and Nicole — thank you for allowing us to rampage through your beautiful showroom for an hour or so. We hope to see you again soon!!! By admin on February 21, 2013 at 11:13 pm | Posted in collaborations, events, photo diary and tagged blog, canada, fashion, fashion week, messeca, new york, nyfw, shoes, style, toronto. Hhaahaha I’d love to see the Lady Gaga flower pot shoes. The rest all look amazing!